(2584, W. P. Campbell Collection, OHS). HALSELL, WILLIAM ELECTIOUS (1850–1934) and EWING (1877–1965). Ranchers, entrepreneurs, and philanthropists, the Halsells accumulated much of their wealth in Indian Territory and later the state of Oklahoma. The father, William Halsell, was born on June 7, 1850, near the town of Decatur, Alabama, and son, Ewing, was born on February 12, 1877, in Jacksboro, Texas. In 1872, when working for his brother-in-law Dan Waggoner, William Halsell drove a herd of cattle from the Triple D Ranch in Texas up the Chisholm Trail to Indian Territory. The herd turned east at the Cimarron River, followed it to the Arkansas River, and then moved up the Verdigris River and east to Vinita. This less-traveled route was called the Halsell Branch of the Chisholm Trail. While attaining permission from the Cherokee government to drive through the nation, Halsell began a lifelong friendship with Dennis W. Bushyhead, later Cherokee principal chief. In 1877 William Halsell and his brother Glenn leased land along the Cimarron River and built a ranch headquarters five miles northeast of present Guthrie. In 1881 the brothers sold all their cattle and grazing rights to the Wyeth Shoe Company for $340,000. Nephews Oscar D. Halsell and Harry H. Halsell remained in this area, working their own herd of 250 cattle. After dissolving his partnership with Glenn, William Halsell, capitalizing on his wife Mary Alice's Cherokee ancestry, moved his operation into the Cherokee Nation. Now an adopted Cherokee citizen, he made Vinita his home and initiated ranching operations eight miles north of Tulsa near Bird Creek. Here he used his Mashed O brand. Halsell enlarged his fortune by buying southern Texas cattle, shipping them to Bird Creek to fatten during the late spring and summer, and then selling them at a large profit. Using this method, he had no herds in the cold months and thereby dodged the harsh winters or droughts that ruined many ranchers. He and then his son gradually began running cattle at Bird Creek year round. 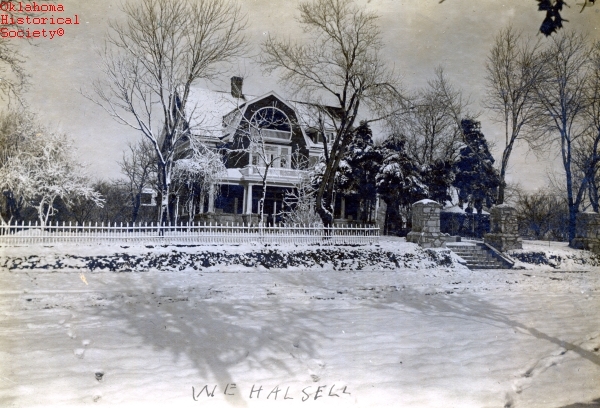 A civic leader in Vinita, in 1891 Halsell rescued Galloway College financially, and it was renamed Willie Halsell College for his daughter Willie Edna, who had died at age eleven. Halsell supported many projects that served the Vinita area. He engaged in real estate, buying town lots throughout the Cherokee Nation and, with partners, organized banks in Vinita, Claremore, and Tulsa. He held the initial presidency in the Claremore and Tulsa banks. In 1900 Halsell bought thirty-six thousand acres that had been Camp Supply, in Oklahoma Territory, of which he sold eleven thousand acres the next year, recouping his initial investment. In 1904 he sold the rest because, he said, settlers would not allow him to ranch the area. In 1901 he bought nearly two hundred thousand acres of the former XIT Ranch in West Texas. In 1893 Mary Alice Halsell died, and William married Josephine Crutchfield, Mary Alice's niece, in June 1895. In 1899 William sold his Bird Creek Ranch to his son Ewing, who married Lucile Fortner, the daughter of a local doctor, in that year. Father and son enlarged their operations, leasing Osage pastures and acquiring more land in Texas. They also formed Halsell and Son Oil and Gas Company. Ewing bought about seventeen thousand acres of allotments in Nowata and Craig counties to create his own operation, the Big Creek Ranch. Later he also bought a ranch in Kansas. In 1916 Ewing, his father, and his sisters, Eva McCluskey and Clare Holmes, formed the Halsell Cattle Company, which operated the Texas ranching interests. For his own enterprises Ewing used the Diamond Tail brand. In the early 1930s he installed feedlots at his Bird Creek and Big Creek ranches, and he and the Halsell Cattle Company co-owned one in West Texas. William Halsell died on November 25, 1934, in Santa Monica, California. He was buried in Vinita. Ewing Halsell, a boyhood friend of Will Rogers, was one of the five original donors for the Will Rogers Memorial in Claremore and served on the design and building committee. He remained connected to the memorial throughout his life. In 1945 Ewing acquired the Farias Ranch in South Texas and moved the headquarters of the Halsell operations to San Antonio, Texas. Ewing Halsell died December 17, 1965, and was buried in Vinita. Later, Jim Ratcliff acquired the Big Creek Ranch in northern Oklahoma. In 1970 the Bird Creek Ranch ceased operation when the Lacy Management Company leased the land from the Halsell heirs. In 1957 Ewing and Lucille established the Ewing Halsell Foundation, a Texas-based charitable trust that has funded many social, educational, art, and health-care projects. Harry H. Halsell, My Autobiography (Fort Worth, Tex. : Wilkinson Printing Co., 1948). William Curry Holden, A Ranching Saga: The Lives of William Electious Halsell and Ewing Halsell (San Antonio, Tex. : Trinity University Press, 1976). William Pearce, "William Electious Halsell" and "Ewing Halsell," in The New Handbook of Texas, ed. Ron Tyler (Austin: The Texas State Historical Association, 1996). Maurice C. Rouse, Cowboy Flat: From Cow Country to Combine (Coyle, Okla.: M. C. Rouse, 1972). Lew Warehime, History of Ranching the Osage (Tulsa, Okla.: W. W. Publishing, 2000). Larry O'Dell, "Halsell, William Electious, and Ewing," The Encyclopedia of Oklahoma History and Culture, https://www.okhistory.org/publications/enc/entry.php?entry=HA014.